Men's Wiley X® Harley-Davidson® goggles designed for a tear-free ride. 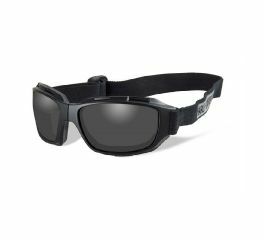 Harley-Davidson® Men's Collapsible Smoke Grey Lens Goggles features Harley-Davidson® script woven into strap. Smoke gray lenses with matte black frames. Fixed foam goggles. Features a handy collapsible frame, great for storing in smaller areas on your bike. Eyewear meets ANSI Z87 high velocity impact and high mass impact requirements. This means they are able to withstand 20 .25 caliber steel projectiles fired at 150 FPS and a 1.1 lb. projectile dropped from 50". No other eyewear offers riders this level of certified protection. Fits head sizes small, medium and large, adjustable head strap. No other eyewear offers riders this level of certified protection. 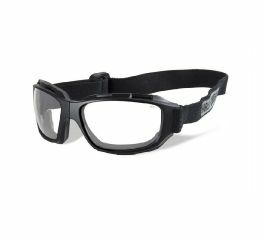 Harley-Davidson® Men's Collapsible Clear Lens Goggles features Harley-Davidson® script woven into strap. Clear lenses with matte black frames. Fixed foam goggles. Features a handy collapsible frame, great for storing in smaller areas on your bike. Eyewear meets ANSI Z87 high velocity impact and high mass impact requirements. This means they are able to withstand 20 .25 caliber steel projectiles fired at 150 FPS and a 1.1 lb. projectile dropped from 50". No other eyewear offers riders this level of certified protection. Fits head sizes small, medium and large, adjustable head strap. No other eyewear offers riders this level of certified protection. Clear Lens: Maximum light transmission. See precise color values. Hazy or overcast, dusk/dawn conditions. 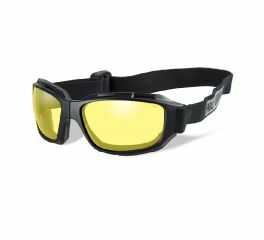 Harley-Davidson® Men's Collapsible Yellow Lens Goggles features Harley-Davidson® script woven into strap. Yellow lenses with matte black frames. Fixed foam goggles. Features a handy collapsible frame, great for storing in smaller areas on your bike. Eyewear meets ANSI Z87 high velocity impact and high mass impact requirements. This means they are able to withstand 20 .25 caliber steel projectiles fired at 150 FPS and a 1.1 lb. projectile dropped from 50". No other eyewear offers riders this level of certified protection. Fits head sizes medium and large, adjustable head strap.